Lilliput Play Homes - cubbies with a brilliantly fun difference! Lilliput Play Homes – cubbies with a brilliantly fun difference! 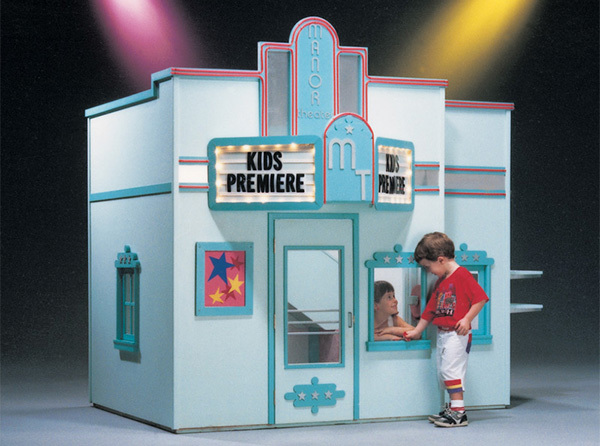 This luxurious lineup of awesome cubby houses and play spaces are so fantastically fun, you’re going to be able to sell tickets to the neighbourhood kids – everyone is going to want to join in on the play! Never before have we seen such a gorgeous showcase of indoor and outdoor play spaces – it’s clear that Lilliput Play Homes know how to play! Currently only available in the US, it won’t stop us dreaming of this talented team branching out to construct such joy in Australian backyards in the future. 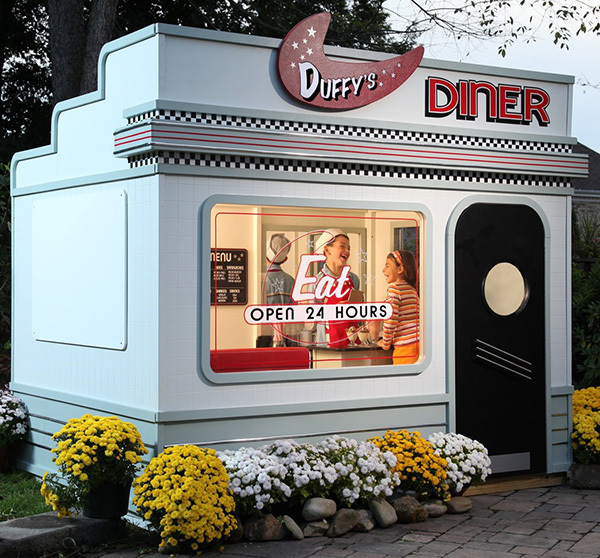 Flip burgers and serve the crunchiest fries in the retro inspired Duffy’s Diner (US$7899) and be sure to get your tickets checked and buttered popcorn at the Nickelodeon Theatre (US$5699). 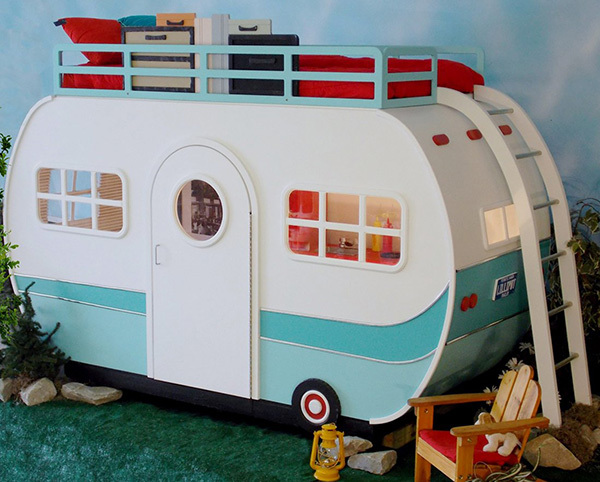 The Family Vacation caravan (US$4299) is a mind-blowing hybrid play space that is part bedroom, part cubby which frankly, is such a magnificent structure you needn’t go on holiday to have fun! Of course, I must mention my favourite. The gong goes to the rather grand Neighbourhood Market (US$5799) with its large paned windows and charming awnings. 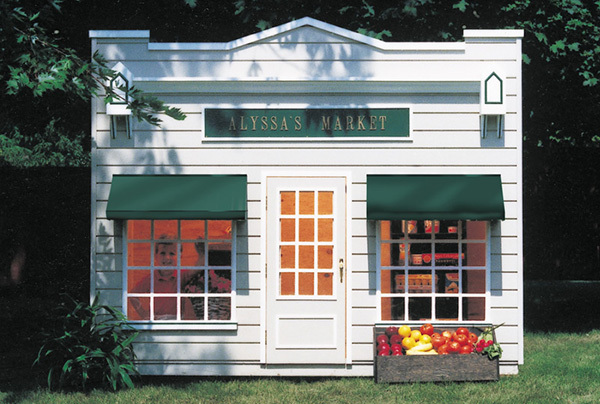 So sweet is it, I’d consider unloading my groceries from the local supermarket into here so I can buy them again from my kids in their market house – though I have no doubt their prices will be grossly inflated. For more cubby house eye candy, go discover the whole collection for yourself (including amazing accessories and furniture) at Lilliput Play Homes. Ot take a look in our previous posts to find fabulous cubby options available locally.